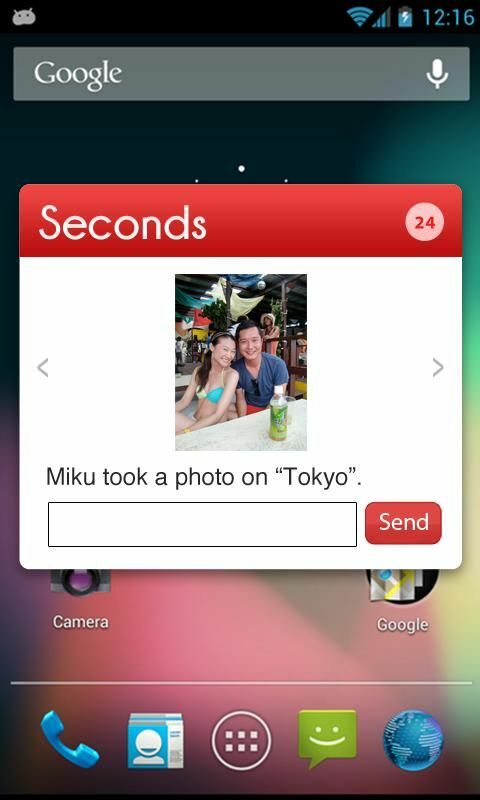 “Seconds, 0 step photo sharing” available on Android Market. 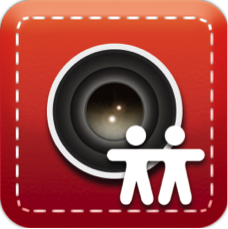 An app eliminates all the bothering steps when sharing photos and opens a new way of communication that is photo-based.Singapore–Available on March 31st, the social camera app Seconds offers a new way of sharing photos and communication. It allows smartphone users to share photos automatically, in real-time with 0 bothering step and then trigger a close, visual and real-time conversation. Seconds partnered with SONY and demonstrated its unique multi-screen UX at Consumer Electrical Show (CES) Las Vegas and MWC Barcelona 2013. Shortly after, Seconds showcased at Start-Up Asia Singapore and Echelon Taiwan. 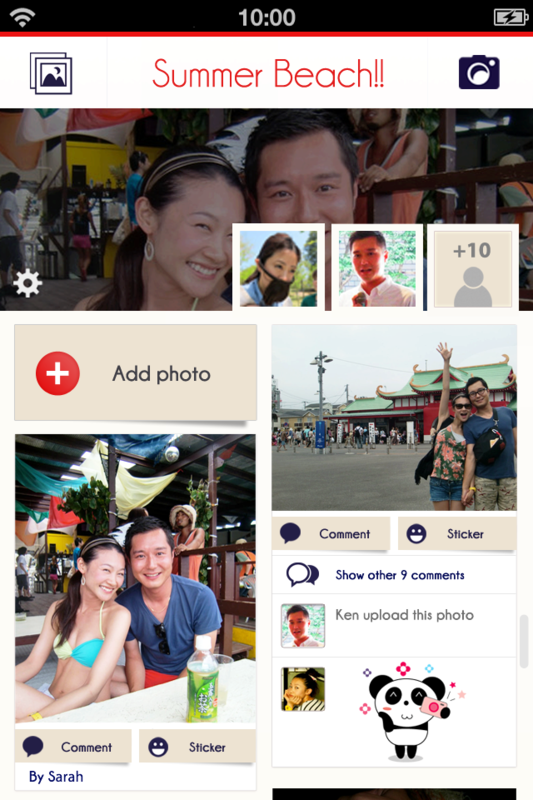 Photo Viewer: A photo can start a real-time conversation with stickers and comments among all members. Album Selector: Users can go to all the albums made by or shared with them. The four default albums will be: Just me, Sweetheart, BFF’s, and Family. Basically, Seconds looks like a normal camera. This gives users the familiar and intuitive experiences when taking photos by their phones. But the special thing is in the right, bottom of the screen. It is where users choose the album they want to put the photos in and who they want to share the album with. 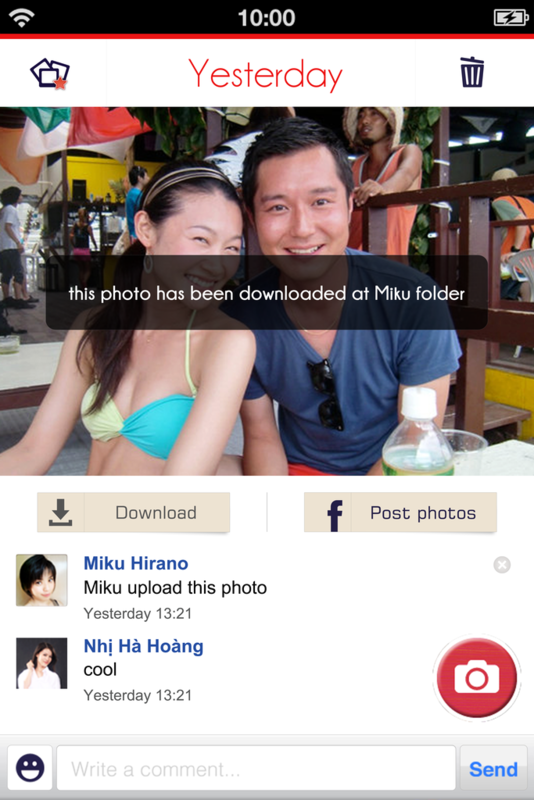 When user shoots a photo, it is automatically shared with other members and they will get notified real-time. Other members could view the photos in full-size and start a real-time conversation by posting stickers to express feelings. All the photos are automatically curated to a beautiful album where every member can shoot, upload photos together. This space is where users, in a relationship of couple, family or friends, experience a new way of communicating with each other. A photo automatically shared among them is a way to save the moments and feelings they have with each other. “Through solving the problem in group photo sharing, Seconds wants to evolve the way people are communicating with their beloved ones. A photo shared by them could convey a thousand of words and bring more meaningful moments in the visual space”, quoted VanAnh Pham, Marketing Manager of Spicy Cinnamon. The application is going to be available in English for free in Google Play Thailand in the early of May. Cinnamon management team believe that Seconds will meet the needs of sharing photos in Thailand – the country of outgoing people and photo-taking cultures. One flavor to add to Seconds’ visual style communication is Fun Stickers. Stickers are an easy and quick way to express one’s feelings without having to entering long text messages. Along with photos serving as a way of visually saving and sharing moments, stickers are expected for visual expressions. They work hand in hand to make the co-effect of visual space of communication. Recently Seconds has organized the sticker contest to support young and creative designers and art students expressing their normal lives through their work. The contest has got many good products by Thai designers as well. Seconds is developed by Spicy Cinnamon, a company focusing on selective sharing, capturing people’s hearts and being founded by two Japanese serial entrepreneurs.